Dr. Todd Austin (a.k.a. 'The Bat Doctor') was the guest lecturer at the ALUUC in Springfield, IL. The bat conservation program was one of a series of ‘environmentally-friendly’ summer programs put on by the congregations ‘Green Committee’. July 15, 2010 - PRLog -- On Sunday, August 23, 2009 Dr. Todd Austin of Virden, IL was the guest lecturer at the Abraham Lincoln Unitarian Universalist Congregation in Springfield, IL. Austin, also known as 'The Bat Doctor', delivered a bat conservation program that was the last in a series of ‘environmentally-friendly’ summer programs put on by the congregations ‘Green Committee’. Austin, a Doctor of Chiropractic from Virden, IL who also volunteers his time as a bat house information specialist, has been an active member of Bat Conservation International (BCI) since 1990. Austin is also a member of the Montgomery County Toastmasters Club which meets in Hillsboro, IL. Todd credits the Toastmasters program with turning his passion and enthusiasm for the world’s only flying mammals into informative yet exciting BAT presentations that others can learn from. Austin has been professionally speaking to audiences about bats since 1996. Since that time he has helped to educate nearly 3,000 people about the only mammals that are blessed with the crowning glory of flight. Dr. Austin spoke to an audience of approximately 100 adults and 20 children using his PowerPoint presentation called “The Wonderful World of Bats”. Austin has compiled a set of over 200 slides that he uses for his bat programs. Many of the photos were courtesy of BCI founder and immediate past president Dr. Merlin Tuttle, who is known as the ‘world’s leading bat photographer’ or from Austin’s own personal work with bats including two recent bat encounters. The presentation was 27 minutes long. Among the highlights of Austin’s presentation were that all twelve of Illinois’s bat species are truly ‘insect-eating machines’, how man-made bat houses can serve as great artificial bat roosts, why the general public should not be handling bats (and what people should do if they find a bat), and that bats which serve as pollinators help bring such products as tropical fruits and nuts and even tequila to the table for human enjoyment. 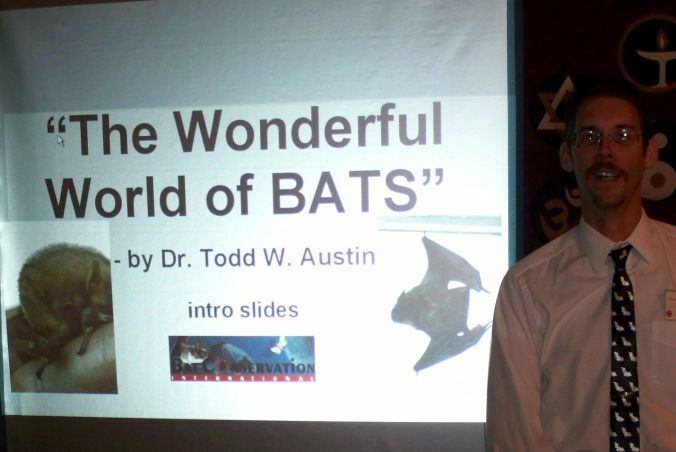 • Photo caption: Dr. Todd Austin, a bat conservationist from Virden, IL was the guest lecturer at the ALUUC in Springfield, IL on Sunday, 8-23-09. 'The Bat Doctor' gave a PowerPoint presentation entitled “The Wonderful World of Bats”. I'm an avid bat conservationist, who has been studying bats and their behavior for 2 decades. I've also been professionally speaking about bats since 1996. I've also been featured in BATS magazine, an international publication (by BCI) on three occasions, with the most recent being the Spring 2010 issue. In this manner, I've personally educated over 3,000 people about how bats are beneficial to humans both ecologically and economically.